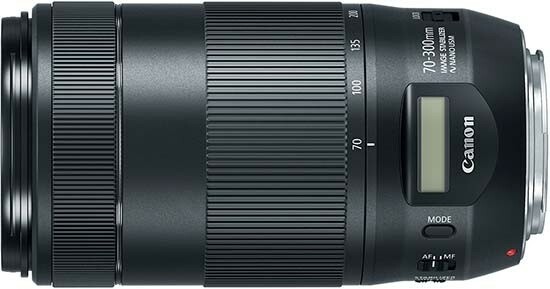 Canon’s replacement for the original 70-300mm f/4.5-5.6 IS lens has a completely new optical design. 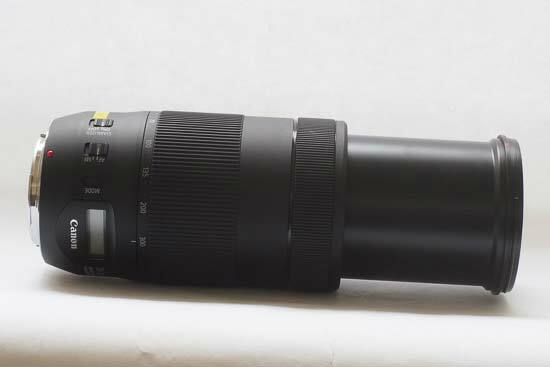 It is intended for hobbyists and advanced photographers looking for a long telephoto lens for a range of applications, including sports and wildlife. 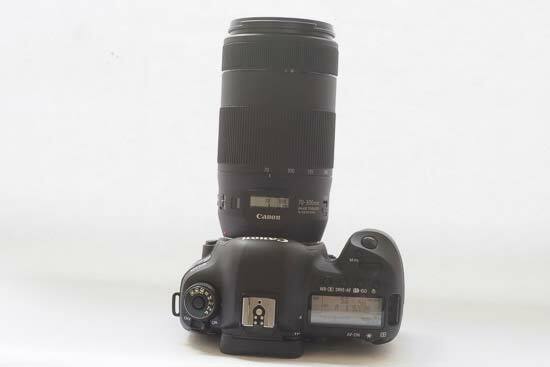 You can use the Canon EF 70-300mm f/4.5-5.6 IS II USM lens with either APS-C or full-frame cameras. If using it on an APS-C camera, the focal length equivalent is 112 - 480mm. The new design features one ultra-low dispersion (UD) lens element, which helps to reduce chromatic aberration. There’s also a new four-stop Optical Image Stabiliser to reduce camera shake and blur, specifically when shooting hand-held. There’s a built-in Nano USM for quick autofocusing speeds, which is also quiet. 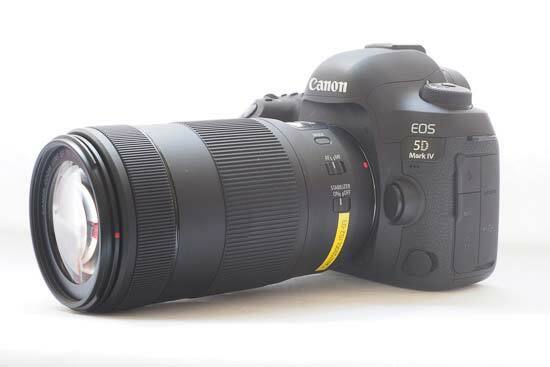 The Canon EF 70-300mm f/4-5.6 IS II USM costs £449 / $499. 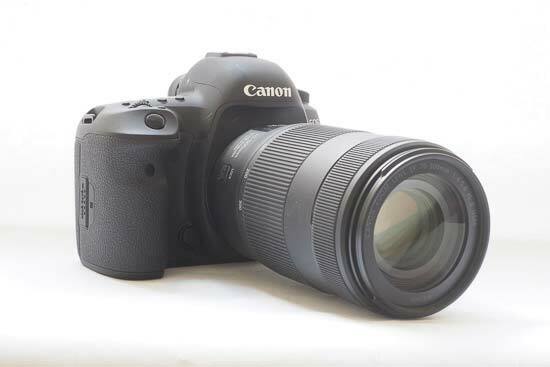 The Canon EF 70-300mm f/4.5-5.6 IS II USM lens is the first Canon lens to feature an electronic lens information display. This takes the form of a small screen which displays key information, including focal length, a depth of field scale at various apertures, camera shake and focus distance. If you have the lens mounted on an APS-C camera, it can display the equivalent focal length, which is very useful. 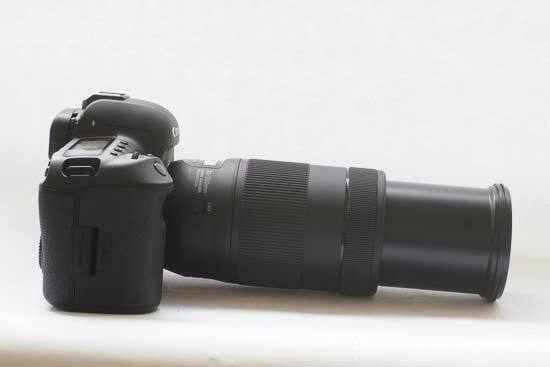 For a long telephoto lens, the Canon EF 70-300mm f/4.5-5.6 IS II USM is not too heavy or large. This would make it ideal for packing in your bag as a second lens while travelling, without adding too much additional weight and bulk to your kit bag. The lens collapses down to 14.55cm when retracted, and weighs 710g. Despite the (relative) small size and weight, the lens still feels well constructed, with just enough weight to give it a feeling of quality. 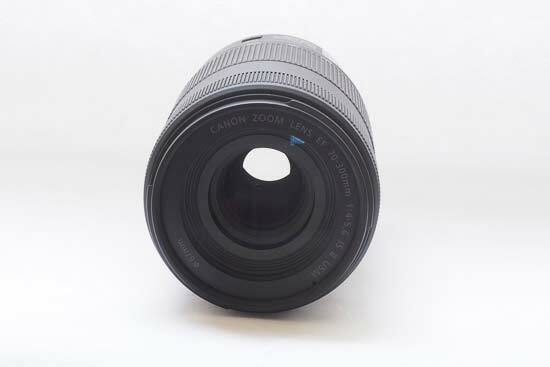 The majority of the lens body is taken up with the zoom ring, which has a ridged coating around most of it to help you get a good grip on the lens barrel. The zoom moves freely and smoothly, having a decent amount of give, and doesn’t suffer from lens creep if you hold it upside down. Another smaller ring is found around the front of the lens, for manual focusing. This also has a ridged texture on it. It’s quite a fluid movement, but it’s still possible to make quite precise adjustments to manual focus. The focusing ring doesn’t have hard stops at either end, which is a shame. At the base of the lens you’ll find the electronic screen, but also some buttons and switches. There’s a mode button which you can press to display different information on the electronic display. There’s also a switch for moving between autofocus and manual focus, and a switch for turning the image stabiliser off (which you may want to do when using your camera on a tripod). Finally, there’s a switch for locking the lens into the 70mm position, which is useful when packing the lens away in a bag to prevent accidental lens creep. You can purchase a lens hood separately from the lens, one isn’t supplied in the box. 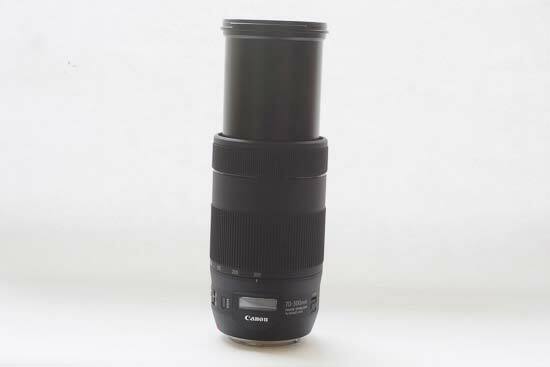 As the Canon EF 70-300mm f/4-5.6 IS II USM lens uses nano USM focusing, it is quiet and quick. 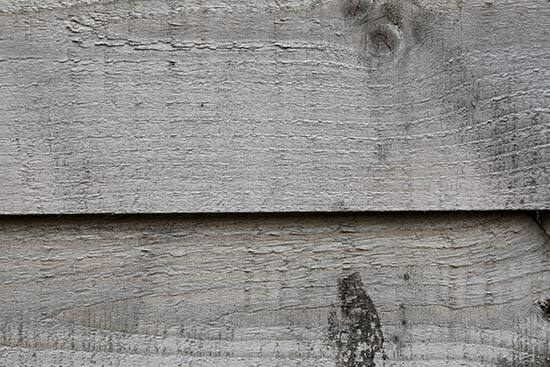 In the majority of situations, it locks onto the target without hesitancy and there’s very little noise to be heard. 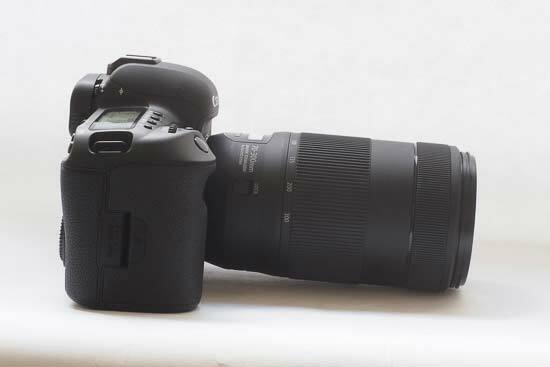 Because it is so quiet, it would make a good lens both for discreet shooting situations, as well as video recording. Focusing is internal, so the front element of the lens doesn’t move while focusing. That means you can use it with filters, if you like. 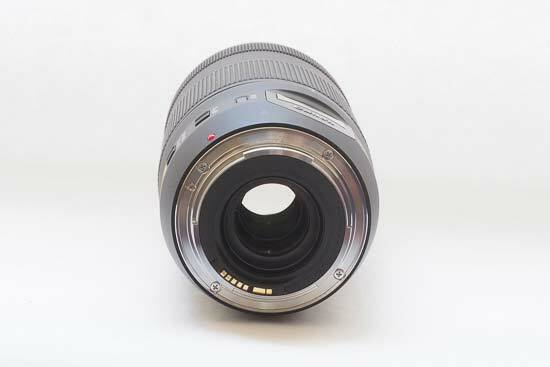 The lens features a 67mm filter thread. 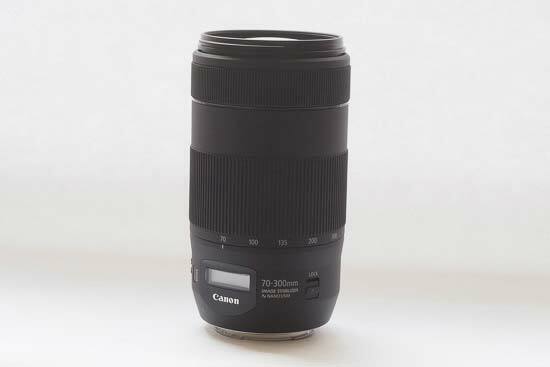 The focal range of 70-300mm is an equivalent to 112-480mm if you are using the lens on one of Canon’s APS-C models. The angle of view (full-frame) is 29 degrees - 6 degrees. 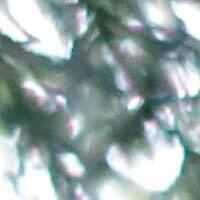 Chromatic aberration is typically seen as purple or blue fringes along high-contrast edges in a photograph. 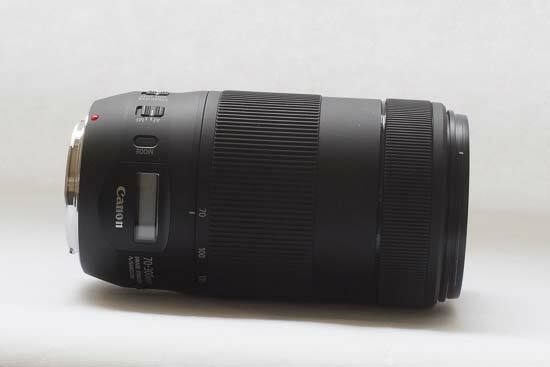 It can be a problem for some lenses, but it does not seem to be a big issue for the Canon EF 70-300mm f/4-5.6 IS II USM lens. 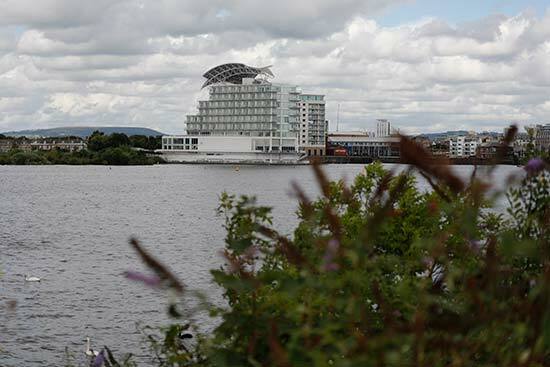 If you examine some images at 100%, you can see some instances of very slight fringing, but it’s not especially obvious at normal printing sizes, or indeed, if you're not actively looking for it.  If you shoot wide-open (f/4) at the wide-angle end of the lens, there is some slight vignetting visible in the corners of JPEG images when shooting a white wall. 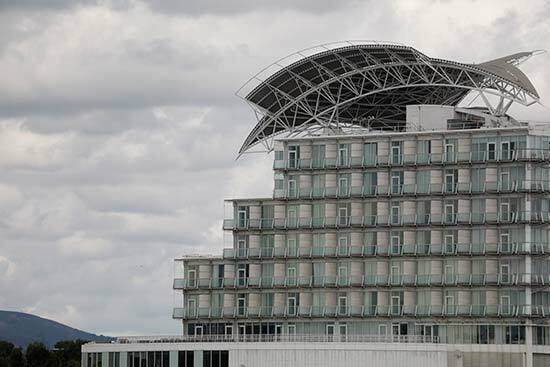 It’s not something you’re likely to notice in more usual subjects, but the problem is a little more pronounced when looking at the uncorrected raw format files. 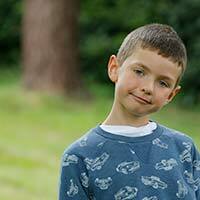 By stepping down to f/5.6, the problem is almost completely removed in JPEG images, and completely gone by f/8. 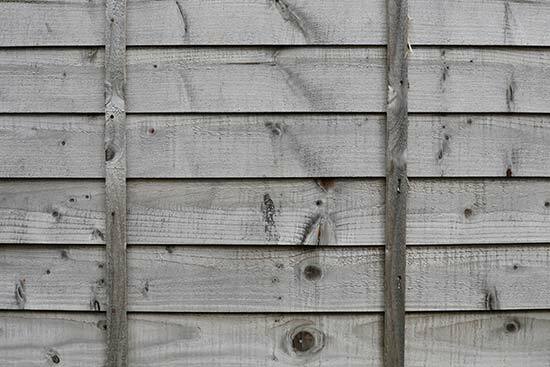 At the telephoto end of the lens, vignetting is a little more noticeable at wide open (f/5.6), but again disappears at f/8, and is also unlikely to present too much of a problem when photographing average subjects. As we’d expect from a lens of this kind, problematic distortion is not particularly an issue, no matter which focal length you use the lens at. 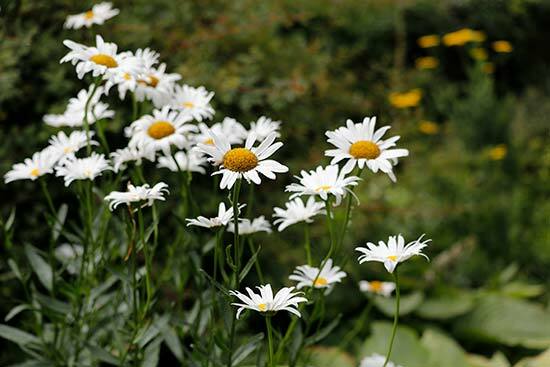 The Canon EF 70-300mm f/4-5.6 IS II USM lens is not designed as a macro lens, however, it is suitable for typical macro subjects, such as flowers - thanks to its long focal length. 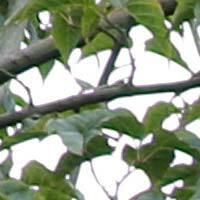 The closest focusing distance is 1.2metres, while the maximum magnification is 0.25x (at 300mm).  There are several ways to describe bokeh, the out of focus areas in an image. Such terms might include creamy, soft, or harsh. Despite the fact that this lens has a relatively narrow maximum aperture, it is still capable of producing shallow depth of field effects thanks to its long lengths. The bokeh produced by the Canon EF 70-300mm f/4-5.6 IS II USM lens can be described as attractive, soft and pleasing to look at.  However, appreciation of bokeh can be very subjective, so we have provided some samples for you to have a look at.